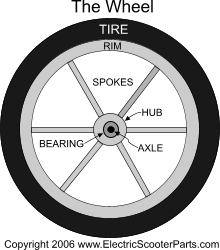 Browse for electric pocket bike wheels by vehicle make and model. Front pocket bike wheel with 90/65-6.5 tire and tube. Tire measures 11" OD and is 3-1/2" wide. Hub is 3-1/2" wide and fits 6000Z or 6000RS wheel bearings. Hub has threaded mounting holes for a three hole brake rotor on one side. Brake rotor mounting holes fit 6mm bolts and are spaced 32mm apart from center to center. 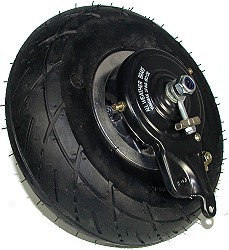 Rear pocket bike wheel with 110/50-6.5 tire and tube. Tire measures 11" OD and is 4" wide. Hub is 6" wide and fits 6000Z or 6000RS wheel bearings. Hub has threaded mounting holes on both sides for a three hole brake rotor and a three hole chain sprocket. Brake rotor and chain sprocket mounting holes fit 6mm bolts and are spaced 32mm apart from center to center. 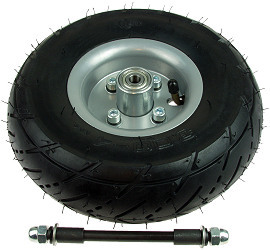 Front electric pocket bike wheel with 3.00-4 tire and tube, two wheel bearings, axle and mounting hardware. Works on version 7 and up of Razor electric pocket bike models. 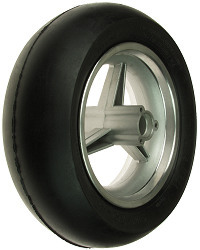 Replacement front wheel for version 7+ of the Razor® PR200 Pocket Rocket electric pocket bike. Includes tire, tube, sealed bearings, axle, band brake, chain sprocket and mounting hardware. For version 1-2 Razor® PR200 Pocket Rocket electric pocket bike. 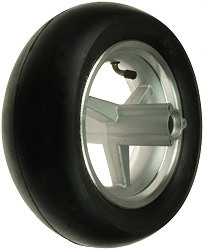 Replacement rear wheel for version 1-2 Razor® PR200 Pocket Rocket electric pocket bike. Includes tire, tube, sealed bearings, axle, band brake, chain sprocket and mounting hardware. For version 3-6 Razor® PR200 Pocket Rocket electric pocket bike. 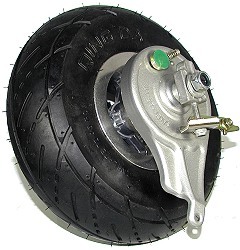 Replacement rear wheel for version 3-6 Razor® PR200 Pocket Rocket electric pocket bike. Includes tire, tube, sealed bearings, axle, band brake, chain sprocket and mounting hardware. For version 7+ Razor® PR200 Pocket Rocket electric pocket bike. Hub width is 5-1/4". Replacement rear wheel for version 7+ Razor® PR200 Pocket Rocket electric pocket bike.